Fiat Doblo to help Chrysler battle Ford in U.S. The Fiat Doblo will be sold with a Ram badge in the U.S.
TURIN -- Chrysler Group's new Ram brand will sell a version of the new Fiat Doblo compact van in the United States. The Fiat-sourced Ram van will go up against Ford Motor Co.'s Transit Connect, which Ford started selling in the U.S. in July. Chrysler is separating the Ram pickup range from the Dodge brand and adding Ram-badged vans. The Doblo will join a large Fiat-based van to be sold in the U.S. by the new Ram truck brand, along with a restyled chassis cab model and light and heavy duty Ram vehicles. With the new range, Chrysler expects to boost Ram sales to 415,000 by 2014, up from 280,000 in 2010. Fiat, which has a 20 percent stake in Chrysler and management control of the U.S. carmaker, has sold the Doblo in Europe since 2001. 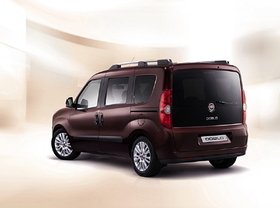 The Italian carmaker unveiled details of its second-generation Doblo on Monday. The new Fiat Doblo will go on sale in Europe starting in mid January. U.S. sales of the Ram-badged version will start in 2012. The Doblo is sold as seven-seat passenger vehicle or as a panel van. Ford builds the Transit Connect for the U.S. market at the Ford Otosan factory in Kocaeli, Turkey. Ford plans to build the Transit at one of its U.S. assembly plants for the 2013 model year, supplier and industry sources told Automotive News. Fiat has no plans to build the Doblo in the U.S. and most likely will export the van from its Turk Otomobil Fabrikasi AS joint-venture factory with Turkey's Koc Holding industrial group. Fiat could also decide to import the Ram-badged Doblo into the U.S. from Brazil where it builds the Doblo for Latin American markets. In Europe, the Doblo's main rivals are the Citroen Berlingo, Peugeot Partner and Renault Kangoo. Fiat said the new Doblo is the best in its segment in terms of interior room and CO2 emissions. The new Doblo's 2755mm wheelbase is longer than rival vans, Fiat says. The new Doblo will be offered in Europe with a gasoline engine and three Multijet diesel powerplants. No details have been released about the Ram-badged Doblo's engines. The most fuel-efficient Fiat Doblo will be powered by a 90hp 1.3-liter Multijet diesel engine and will have CO2 emissions of 129 grams per kilometer. For the new Doblo, Fiat is using a revised version of the platform used on the Grande Punto small car. The Doblo will offer in Europe a stop-start system that boosts fuel economy. The system cuts off the engine temporarily when the vehicle is stopped. Fiat also will add in Europe a Doblo that can run on compressed natural gas.